GaN/AlGaN based High Electron Mobility Transistors (HEMTs) are being widely developed and used for variety of microwave power applications due to their superior electron transport properties. In the present study, effect of HCl pre-metal dip followed by low power Argon (Ar) plasma exposure for fixed time is studied, during HEMT fabrication, and reported. The electrical characterization of the source/drain ohmic contacts is carried out using circular Transmission Line Model (c-TLM) method. The surface morphology and the structural analysis of the contacts are evaluated using XRD, SEM, AFM and SIMS. Ti/Al based metal systems displayed lower contact resistance and increase in device current values Ids when exposed to Ar plasma. The improvement of Rc values is correlated to lowering of barrier height as indicated by XPS analysis. 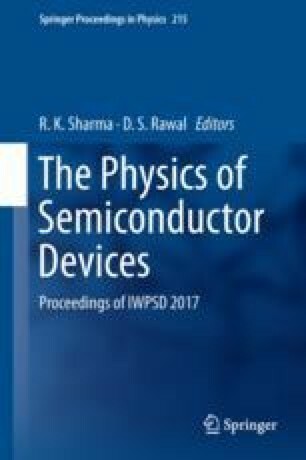 This is mainly due to preferential sputtering of N during Ar plasma treatment that creates N vacancies on GaN surface increasing surface doping concentration suitable for ohmic contacts. Hence Ar plasma treatment along with HCl pre-metal dip facilitates achieving lower contact resistance of ohmic contacts.